The Naked Grouse Blended Scotch Whisky is a popular Whisky available from Waitrose Cellar in 70cl to buy online. Visit Waitrose Cellar for the best price for 70cl of The Naked Grouse Blended Scotch Whisky or compare prices on our other Whisky products. With a nose that is smooth and oily with notes of cherry compote, buttered granary toast, malt, custard and peach giving a palate that is sherried and thick with notes of sultanas, sticky toffee pudding, raspberry jam, Victoria sponge, custard and crème caramel. The finish is medium in length, with notes of cocoa, oak and just a soupcon of smoke on the very tail. 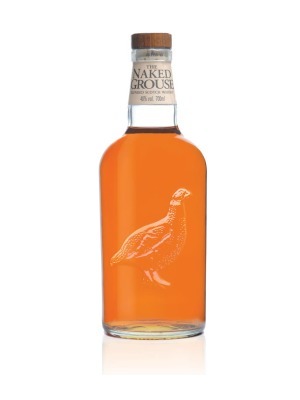 Where to buy The Naked Grouse Blended Scotch Whisky ? The Naked Grouse Blended Scotch Whisky Supermarkets & Stockists. You can buy The Naked Grouse Blended Scotch Whisky online in most retailers and find it in the Whisky aisle in supermarkets but we found the best deals online for The Naked Grouse Blended Scotch Whisky in Waitrose Cellar, 31dover.com, DrinkSupermarket.com, TheDrinkShop, and others. Compare the current price of The Naked Grouse Blended Scotch Whisky in 70cl size in the table of offers below. Simply click on the button to order The Naked Grouse Blended Scotch Whisky online now.